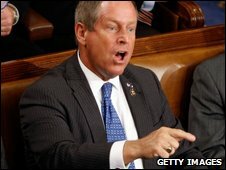 A Republican lawmaker has apologised for his "You lie!" outburst during US President Barack Obama's key speech on healthcare reform in Congress. Joe Wilson, a congressman from South Carolina, said: "I extend sincere apologies to the president for this lack of civility." Both Democrats and Republicans swiftly denounced his behaviour. Mr Wilson's outburst came after the president said illegal immigrants would not benefit from his healthcare plans. Mr Obama replied to Mr Wilson's remark "That's not true" before continuing his speech on Wednesday evening. "I let my emotions get the best of me," Mr Wilson said in a statement. "While I disagree with the president's statement, my comments were inappropriate and regrettable." The lawmaker also tried to call the president to apologise personally, but ended up talking to White House Chief of Staff Rahm Emanuel instead, Mr Wilson's office said. House Majority Leader Steny Hoyer, a Democrat from Maryland, said the congressman "ought to apologise to the House as well". Mr Hoyer told MSNBC the incident was something that "in 29 years I have never heard said in a presidential speech on the House floor". House Minority Whip Eric Cantor, a Republican from Virginia, also criticised Mr Wilson's behaviour. "Obviously, the president of the United States is always welcome on Capitol Hill. He deserves respect and decorum," he told ABC. Vice President Joe Biden said Mr Wilson's outburst "demeaned the institution", while Senator John McCain, Mr Obama's Republican rival in the 2008 presidential polls, said such behaviour was "totally disrespectful".